DOUG MCVAY: Hello, and welcome to Century Of Lies. Century Of Lies is a production of the Drug Truth Network for the Pacifica Foundation Radio Network, on the web at DrugTruth.net. I’m your host Doug McVay, editor of DrugWarFacts.org. Well we’ve got a lot of stuff on the show today, let’s get to it. The state of Colorado’s legislature is looking at adding PTSD to the list of symptoms for which medical marijuana can be recommended. The state of Colorado of course legalized adult use of marijuana back in 2012. They had a medical cannabis program prior to that, they still have medical cannabis. Unlike several other states, the medical cannabis program in Colorado seems to be surviving, and even thriving, alongside the adult use program, rather than being rolled into the two, with tax revenue lighting up the eyes of legislators. In Colorado, they seem to still care about the possibility that there are patients out there who rely on medical cannabis to help them with their pain, to help them to live with whatever condition it is they suffer from. Again, in Colorado they’re considering adding PTSD to the list of conditions for which marijuana can be recommended. In Indiana, we looked at last week, along with syringe exchange, the state legislature is also considering the possibility of a medical marijuana program. A lot of good things are happening around the country. Here in my home state of Oregon, of course, as medical marijuana continues, we have the adult use program rolling out. There have been a lot of changes going on here. One way to keep in touch with all those changes, of course, are these conferences that keep popping up. 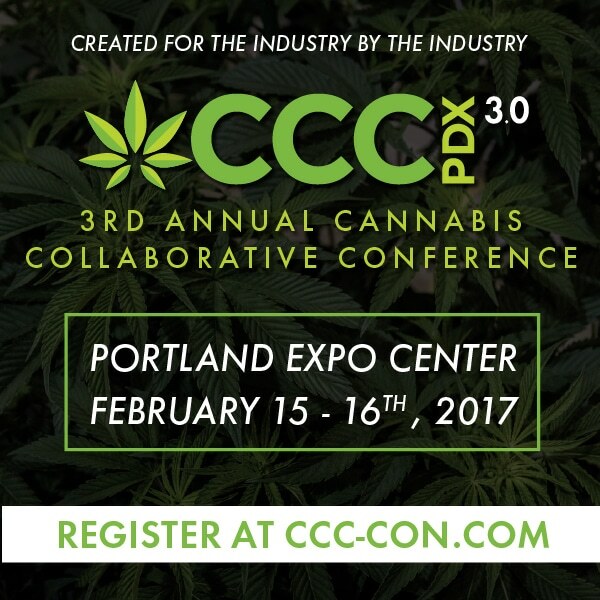 Coming up February 15th and 16th here in Portland, Oregon, is the Cannabis Collaborative Conference. It’s the third year for this conference. I had the chance to speak with Mary Lou Burton, who is the coordinator and the founder of the CCC. MARY LOU BURTON: Hi, this is Mary Lou Burton, and I’m with the Cannabis Collaborative Conference. DOUG MCVAY: Mary Lou, now, you’ve been holding these conferences for the last few years here in Portland. It started out as the Creative Conference, am I right? MARY LOU BURTON: Yes. When the industry first — actually it was prior to the vote and legalization, I’d been talking to some of my friends up in Washington, who started a Tier Three grow. And so, over about a six month period, I saw what they went through, the hurdles, the good, the bad, and when we heard that Oregon was going to go legal, they recommended that I basically take and develop a conference, because my past business is a wedding and corporate event business, where I’ve done trade shows for 28 years. So, we created this thing, basically the first conference was about the industry, education, you know, what can we expect. We worked with OLCC and actually were able to videotape their application process, and they put that on their website and they realized that they had about 4,200 clickthroughs for people to go in and look at the actual video, rather than read a 400 page manual. So then the second conference, in 2016, we brought everybody together, and that’s after everything was legalized and OLCC came in and they did their seed to sale training within the conference. We had over 70 speakers, about 30 different tracks, and we videotaped everything so after the conference we could actually share those videos with people as well, because there are just — with it being a whole new industry, you know, we’re kind of blazing the trails of, you know, what to expect and what we’re finding is that things are changing daily, so our sessions are changing daily. Somebody approached us last week with a last minute idea on cyber attacks and how to handle Facebook and social media being shut down. These are things that people in this industry have to navigate through, and it’s great to be able to learn from the others. And our, I think our tagline is — I mean, I know it is, working with several of the key players in the industry, CannaGuard, MRX, Chalice, we sat down and they’re like, here’s what we want in a show. We want it to be for the industry, by the industry. So, when we created our first show, the media were coming through and basically going, oh my gosh, you have Microsofted the cannabis industry. And, made a very professional but open to that — to just everybody in the market, to learn and to work together, unlike some of the other markets, basically, everybody was navigating on their own, so this is an opportunity to pull together the entire industry. DOUG MCVAY: You, indeed, and blazing a trail, now, that reminds me, last year’s conference, you brought in a Trailblazer, that was the first appearance of Cliff Robinson, Uncle Cliffy. MARY LOU BURTON: Yeah, he actually approached us, and was getting into the industry, and agreed to get up and speak about the benefits of cannabis to an athlete. And, you know, there’s very few people that are willing to kind of stand up, but it’s happening more and more. I mean, now there’s a whole sports segment of the benefits, and he said that he saw many of his co-players get hooked on opiates, the pain was just extraordinary, and he would say that he actually would get kind of sick to his stomach prior to a game, and that the cannabis would actually help him kind of de-stress, and be a little bit more, you know, not be so nervous. And then, gosh, the medical benefits all across the board. We did the Oregon State Growers Fair, with the live plant competition, and all this, and I had about 45 people come through the show that had actually been sent by their doctors, and the doctors said, don’t tell anybody but I really think that cannabis could help you. So, at the Collaborative Conference, we have some scientists from OHSU, Brown, and Harvard coming in to share some of their very first studies, and there’s over 80 speakers, 30 different sessions that basically cover everything. On the Fourteenth, it’s our Investor Summit, and that is 12 to 5, and we have two different tracks. One that is for people that have money that would like to get into the industry and invest, the other track is for entrepreneurs that are needing money, and kind of an education on how do they go about doing that. And, you and I were talking earlier, that I’m trying to keep, you know, my gauge on the industry as all the things that are going on and what people need help with, and the biggest need right now is financing. Because of everything that’s happened in the last three months, with the crossover to rec, and the testing, and lab situation, these companies that were thriving, now are kind of struggling, because they only, they didn’t anticipate all these hurdles. So, at the conference, on our website, we’ve developed what we call a Pitch Portal, where these people can come in and fill out a very basic form explaining their business. No financials, but then we’re actually sending those pitches out to about 30 investors, because investors are coming to me, going, I have no idea how to find the opportunities in this industry. There’s really no Angie’s List, or — they’re jokingly saying, you know, you need to do the Mary Lou’s List. But, we are — basically what we’re calling Cannabis Connects is when somebody comes to me, like a retail store, and they say, I need a partner, I need financing, or I want to sell out, then I’m connecting them with the people that are interested in buying. So, it really helps. And this conference really is about making — getting strong, working together, partnerships, mergers, acquisitions, financing, and thinking about your exit strategy. You know, there’s a couple of businesses that have come to me that are doing a phenomenal job, and they’re like, you know what? Our goal is for a Phillip Morris or a large pharma to buy us out, and then we can go retire. Some people, some want to become a craft grower, and with Oregon being such an incredible craft market, with our wines and our beer, it is a great opportunity. And I feel that those growers and the people that have really been the activists and have powered through this whole thing, and have gone through the struggles, they are the ones that really deserve the credit, and the success. So I’m trying to help them be better businesspeople, and navigate through all the hurdles and obstacles, because personally, I would hate to see the people that have worked so hard and made the sacrifices get run over by big industry, and it’s already here. I’ve heard that there are companies that are being allowed to do studies, and because they’re allowed to do studies they’re allowed to grow, and then they’re allowed to sell the crop. So, you know, every industry will have to transition with that, and you can either be prepared or not. So, we can’t help everybody, but, one of my people, one of my growers that went through the Growers Fair, actually went through and talked to all the exhibitors, and she actually struck a deal where one exhibitor is actually buying all her crops now. So, wow, how simple is that? To be able to have somebody that, she’s the expert grower, and now she doesn’t have to worry about selling, packaging, or anything like that. So, it’s just — I have to tell you, I’m so excited, and it has been such a pleasure to work with people in this industry, and to be able to help in whatever way we can. So, this conference, basically, they literally can meet over 130 exhibitors, come and see our keynote, George Zimmer. Men’s Wearhouse, do you remember George and all his commercials? MARY LOU BURTON: Very long time. DOUG MCVAY: very, very supportive of California’s efforts, and has been out there doing things. Nice guy. MARY LOU BURTON: Great guy, and it’s kind of like Cliff Robinson. You know, George basically, you know, he was Men’s Wearhouse, and built a very large company, and, you know, he jokingly said, yeah, cannabis really affected me, you know, I’m doing pretty good. So having really important people and key players that — like that, that are stepping up and becoming more visual, it’s going to really help people, people that were afraid of the industry, will open their eyes and go, this isn’t going away. I mean, the last report that came out, it generated $60 million in tax dollars. I mean, think about the ramifications of what that will do for education, what that will do for mental health, all these things that are being cut that are so important. I mean, it’s, you know, there’s — I know there’s people that are opposed to it, but I think that they the biggest part is becoming educated. Like, I just had a friend who called me up, and, very mainstream, has never used cannabis before, but she was going into surgery, and she called me up and said, I really don’t want to go on the oxycodone and all the stuff that the surgeons are recommending. So I told her to, you know, go onto websites, research, go into a dispensary, a retail store, and ask them. These budtenders are so educated, if you go in and say, I have a hard time sleeping, I have anxiety, I mean, there are so many different things out there. So this gal, the friend of mine, literally went to her surgeon and asked, what do you think about cannabis. And because she asked, he was able to say, I think it’s a great option, and, you know, this is what you should do. So I think doctors are looking at this, you know, some are opposed, of course, and I think big pharma is, you know, a big player in that, but if people knew the benefits. I have an 83 year old neighbor, and she has a back pain that is so debilitating that she can barely walk, and she tried a transdermal patch, and she literally called me the next day and said, I danced at a wedding for the first time. And she goes, where can I do this? She goes, all my friends, they’re old, we’re all in pain, we just want to enjoy the last years of our lives. She goes, come and pick me up in a bus, take me to a retail pot store, and then to the casino. So, I just, you know, that — just, all across the board, seen the medical benefits, the children with epilepsy, just the stories are unbelievable, and by getting this information out there, allows people to make their decision of, you know, do they want, are they interested or not? And the big point of OLCC, which they’ve done a phenomenal job. I mean, this is a brand new start-up industry, but they’re really working hard at educating children that this is not something that children should deal with, and that happens, so they have a whole program about education and the child-proof packaging that is so more expensive than any of your pharmaceutical drugs. I mean, I’ve been impressed with what they’re doing to basically make sure that it does not get in the hands of children or whatnot. So, very responsible industry, and the rules and regs that they’re setting up are pretty incredible. DOUG MCVAY: You’re listening to Century of Lies, a production of the Drug Truth Network for the Pacifica Foundation Radio Network, on the web at DrugTruth.net. I’m your host Doug McVay, editor of DrugWarFacts.org. We’re speaking with Mary Lou Burton, she’s the founder and coordinator of the Cannabis Collaborative Conference, in its third year, coming to Portland, Oregon, on February 14, 15, and 16. The main event itself is on the 15th and 16th. On the 14th, they’re having a pre-conference investors seminar, in which people can pitch ideas, and among other things learn how to talk to investors and how to convince them to put money in. It’s a very specific skill, doing these pitches is not easy, and a lot of people — well, if you’re like me and you have a mild stammer, it can give people pause. Learning how to do this stuff really can be important. Anyway, let’s go back to that conversation with Mary Lou. Now, you mentioned that you’re going to have someone talking about, among other things, electronic security, computer security. DOUG MCVAY: That’s a — it was only about a month ago, in fact just a little less than a month ago, when news about the hack on — the attack rather on MJ Freeway, which is one of the biggest, I mean, it’s one of the biggest electronic point of sale systems, seed to sale control systems. But it got hacked, it was down for weeks. Not a lot of people heard about this outside the industry. You’re going to be having someone talking about that, an aspect of security nobody thought they were going to have to deal with. MARY LOU BURTON: She approached us a week ago and said, you know, I think this is a really important segment, so we basically figured out a way to incorporate it because we felt it’s something that people need to know about, to help protect themselves, because, you know, it’s a very dangerous, it’s happening not only in the cannabis segment, but in mainstream, you know, constant things like that, and we’re so committed to the internet, and, you know, in a minute, we could — our businesses could be shut down as a result of it. So, I think her coming and sharing her information and what they’ve learned is going to be very valuable. DOUG MCVAY: Oh, exceptionally so, as I say, it’s not a — it’s a story that, I mean, sure, it hit the news, but didn’t get a lot of exposure, and a lot of people in the industry — I mean, it’s, as you’re creating this thing, it’s that whole let’s build it, hurry up and build it and figure it out as we go along, and that really is one of the, in this internet age, that’s one of the things you really, that you really have to pay attention to is that electronic security, and you having one of those there is — it’s cutting edge. MARY LOU BURTON: Like you’re saying, you know, it could put you out of business before you even know it. So even though a lot of people do not want to research and invest in making sure that they’re protected, I think it’s a number one priority. You know, that people have to — you can’t just piecemeal things together, but at the same time, that’s what the conference is about, is, I feel like everybody that’s getting into the industry can learn from other people’s experiences, because there’s people that have lived through this stuff, you know, over the last year, I mean we don’t have a long track record, but we can learn from that, and figure out how to run a successful business, because, you know, I’ve got people coming to me, I have a million dollars, I want to get into this industry. And the thing I have learned over the last three years, that if you do not know how to grow, and how to grow organically, without pesticides, then you shouldn’t be in the business. So I basically told this gentleman with a million dollars, I said, let me hook you up with a grower that knows what they’re doing. And they need help with the business operations, and they need a cash infusion. So, I said, now you can just sit back and watch your money grow, ha ha, rather than trying to — because people are calling it the “Green Rush,” and that is not true. It is a very, very difficult industry, and people jumping into it thinking they’re going to make millions, they won’t, unless they partner with really quality people that know this stuff. It’s those connections that happen at the conference, making sure that, you know, you can ask questions. James from Savant Plant Technologies, after George Zimmer’s keynote, he is basically doing how to set up a commercial grow from A to Z. It’s amazing. He’s going to come out and share his secrets. He basically has a greenhouse company. He partners with the nutrients, the soils, the seeds, the fencing. Literally he can get somebody up and running, from A to Z. So him coming and sharing his secrets, and his 20 years, 20 plus years in the industry, his mom was a horticulturist and a botanist, and so he learned it, it was the family business. He said his hobby greenhouse is a 30′ by 96′. MARY LOU BURTON: Cy Scott. Cy Scott is basically the co-founder of Leafly, but he has started a whole new company, and he’s going to be announcing that at the show, which I think is going to really, really be a pretty exciting addition and help for the industry. DOUG MCVAY: — lot of stuff. And the investor forum. MARY LOU BURTON: Yeah, that is on the Fourteenth, Valentine’s Day. And then throughout the two days of the conference, on the 15th and 16th, we have an investor lounge, where people can come in, meet with investors, talk to them, if they can’t come to the conference they can submit their pitch on our Pitch Portal, on the website, and that’s free. And then we will try to connect them with investors the best way we can. So just a service that I think is seriously needed in this industry. But we’ve got anywhere from probably 20 to 30 investors. Some that are private, that just have money that they’d like to put into the industry. Some are funds, some are equipment financing, dynamic alternative financing. Scott Jordan’s going to be there, and he’s actually already written up about six deals that I’ve connected him with. So it’s really exciting to be able to help people with these hurdles. Rather than just being a show, we want to be a service, and help, and a resource. DOUG MCVAY: And you’ve been doing a lot of this up here in Oregon for the last few years, too, so people are going to — are OLCC going to be doing a thing again this year? MARY LOU BURTON: Oh, I am so glad you brought that up. They are going to do an area in the show, where they’re bringing in — OLCC will be there the full two days to answer questions, to meet one on one. They’re bringing in Oregon Department of Agriculture as well as Oregon Department of Revenue, and they’re going to have their packaging expert there, so somebody could bring their packaging and go, is this right? Does this meet the criteria, the requirements? So a real, kind of hands on, instead of a presentation it’s — they’re going to be there for the two days to meet with people. And that’s worth the price of admission right there. DOUG MCVAY: Well, you know, and that’s just it, it’s going to be a — I mean, the industry is obviously not just evolving, but this is the — I mean, the adult social use has really started on its own just recently, the medical dispensaries, for listeners outside of Oregon, medical dispensaries are now no longer in that kind of zone where they are able to simply sell to the adult use market, they now have to specifically register with the Liquor Control Commission to be able to do all that. And many have, of course, but the thing is that we’re — and the legislature is just, well, in fact we’re recording this interview on February Third, the state legislature has just been meeting again for the last couple of days, this is the long session. We know there are going to be several bills looking at making some changes and adjustments in the industry as we’re rolling out, as we’re moving forward. So this is a heck of a time to be in the business, it’s a good time to be learning about how, what’s going on. It’s a great opportunity. MARY LOU BURTON: Yes, and they’re going to have some decisions made that they may be announcing at the conference, so after their first couple of sessions. I have to applaud OLCC, and the legislature, because, I’ve never really seen politics and government move as fast. And really try to solve the issues. I know that some people get frustrated, but I have to really applaud what they’ve done. And they look at what is affecting the industry. They of course do not want to sacrifice tax dollars, because those tax dollars are going to help so many programs that have been cut. You know, it’s really an amazing thing, and I’m just very proud to be pulling together, you know, the OLCC, and be able to move forward on some of the things. Like Anne Lininger, Ginny Burdick, their goal is to make Oregon the hub, the model cannabis state. And what that does for the local economy, we become experts. And we become the go-to state. I was just on the phone with some people from California that are coming up, and we’ve got several states coming in, and they’re like, we want to learn from what Oregon’s doing. So these people coming in from the other states, we’re actually going to take them on a tour of a grow, a retail store, and they’ll get to learn about it. So, Travel Oregon and Portland has said that this has increased tourism, increased hotels, so, there are so many benefits to the whole thing that, you know, I think that we won’t even know all of it for another year. What you’ll be able to learn in the two days, I know it’s hard sometimes for small business to take that time off work, but I think, you know, people have told me it’s been a year’s worth of research all in two days, as well as the connections. DOUG MCVAY: Mary Lou, thank you so much for all your time. Best of luck. MARY LOU BURTON: Thank you, take care. That again was a conversation with Mary Lou Burton. She’s the coordinator and founder of the Cannabis Collaborative Conference, in its third year, coming to Portland, Oregon, on February Fifteenth and Sixteenth at the Portland Expo Center. There is a charge for admission. You can get all that information by going to their website, which is CCC-CON.com. And well folks, that’s it for this week. Thank you for joining us. You’ve been listening to Century Of Lies. We’re a production of the Drug Truth Network for the Pacifica Foundation Radio Network, on the web at DrugTruth.net. I’m your host Doug McVay, editor of DrugWarFacts.org. The Drug Truth Network has a Facebook page, please give its page a like. Drug War Facts is on Facebook too, give it a like and share it with friends. Remember: knowledge is power. You can follow me on Twitter, I’m @DougMcVay and of course also @DrugPolicyFacts. We’ll be back next week with thirty minutes of news and information about the drug war and this Century Of Lies. For now, for the Drug Truth Network, this is Doug McVay saying so long. So long!